It was lunchtime and I was hungry, prowling Pinecrest Gardens Green Market for something to eat one Sunday last month. Came across Chef Adri Garcia at the west end of the market. She was cooking up sliders made with grass-fed beef raised on a farm in rural Northwest Florida near the Georgia-Alabama border. Now I don’t usually eat beef and didn’t think I missed it. But Adri insisted this was different. Grass-fed, not corn fed. Cows roaming in bucolic pastures, none of this chemical feedlot nonsense. She recommended the sliders, and her dad Carlos Garcia was at the grill and quickly whipped some up, accompanied by seasoned potato morsels. The meat was seasoned nicely with “four secret ingredients” that Adri refused to divulge. (Garlic might be on of them.) 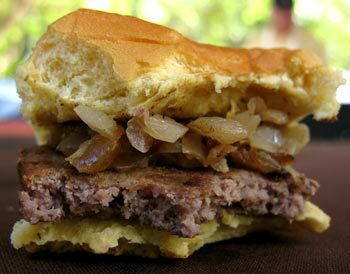 The meat was chewy and had texture but wasn’t tough, and was lean, not too greasy. A really nice beef flavor came through and I had a moment of food bliss. Then I came to my senses and asked for grilled onions. Took another bite, oh so good. Reminded me of burgers that I ate when I was a kid — only better. Adri suggested adding her quick pickled cucumbers with onions and red pepper. Sure, why not, load ‘er up. They added a pleasant sweet-sour bite. A Real Coke with real sugar (none of that fructose stuff) from Mexico completed my trip down memory lane when food was, well, real. Yum! Sink your teeth into this! The grass-fed meat was sourced from Arrowhead Beef, a co-op of family farms in Chipley FL that raises Parthenais cattle, an heirloom breed which originated in France in 1893. The cattle ranges freely on open pasture eating grass and forage, and is never given antibiotics nor hormones (according to the farm’s brochure). The beef is restaurant quality and wet aged for 28 days. Adri is the South Dade distributor for Arrowhead. Order your cuts and come pick them up at the market on Sunday morning. Contact her at 786-368-3479 or adrigar2003@yahoo.com for prices and ordering information. Prices are 25 to 35 per cent less than Whole Foods. Free delivery for orders of $100 or more. 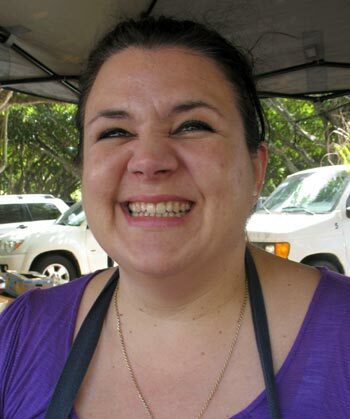 Chef Adri will be at the Pinecrest Gardens market through May. As for her prepared foods, she has added Asian tacos with tri-color sesame slaw, hoagies made with Italian style sausage, peppers and onions, and homemade piraguas (Puerto Rican snowcones) to the menu.